Arwind Kejriwal sworn in as New Delhi Chief Minister. Rohit Gautam/Demotix. All rights reserved.The voters of Delhi caused a political earthquake by humiliating the Prime Minister’s Hindu nationalist party BJP and stopping its winning spree in the provincial poll battles. They gave a record mandate to an unconventional political outfit formed just two years ago by a motley crowd of activists protesting against corruption. The extraordinary result of this prestigious regional political battle has left the commentators breathless, the state BJP gasping and the federal Government thinking. Indian elections are never a dull affair. They cause waves and storms. This dramatic poll outcome is being described as the tsunami that swept away the Modi wave. 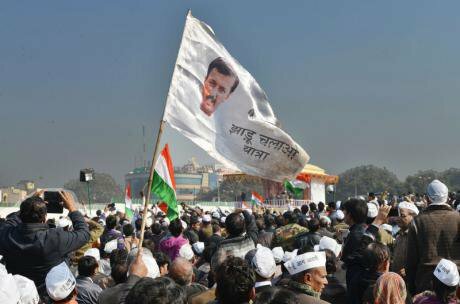 The Aam Admi Party (the common man’s organisation) won as many as 67 of the 70 seats in the Delhi State legislature. Prime Minister Narendra Modi’s BJP managed to get just three of its candidates elected. The Congress that ruled Delhi for 15 years till 2013 failed to win even a single seat. The Delhi State Government will be led by Arvind Kejriwal, a product of the Indian Institute of Technology and former tax official, who came to politics after a brief experience of street-fighting as an anti-corruption crusader. During the poll campaign, Prime Minister called him a Naxalite, (an ideological armed guerilla fighting against the state). The poll results can be seen as a victory for true or proper democracy. The democratic process is generally vitiated by money and muscle power, an unlimited advertising budget underwritten by the big corporates and a partisan media. It is afflicted by divisions on the basis of class, religion, caste and gender. AAP transcended such divisions, winning support from the urban as well as rural voters. The winner demonstrated that a political party can afford to refrain from using big money and muscle power and stoking fires of sectarian conflicts. It attracted well-placed professionals, generally indifferent to politics, to join its campaign team. That the voters understood the danger of concentration of political power in an individual was clear from this writer’s interviews with several voters. Even those not disillusioned by the Prime Minister’s performance and the less literate said they want a different party to rule the state! They wanted to keep Modi’s dictatorial tendency in check. Kejriwal, in their eyes, was an underdog because the Prime Minister launched personal attacks against him! The Aam Admi Party (AAP) represents a new kind of politics and one of its stated objectives is to revolutionise the present political culture. It has no ideological baggage and concentrates on simple problems. It uses a lot of pro-poor rhetoric and condemns crony capitalism. Its campaign forced the BJP to talk of the poor especially since Modi is seen as a favourite of the rich. AAP is being called the New Left. Curiously its pro-poor rhetoric does not upset the upper classes who feel threatened when the Communists talk the same language. The traditional Left that alone fights BJP’s sectarianism most vigorously has nearly been decimated in most parts of India. AAP first entered the political arena by contesting the last Delhi state elections. It put up a creditable performance but failed to win a clear majority. After initial hesitation, it formed the Government with the support of the Congress and other political enemies of the BJP that won the largest number of seats but was also short of a clear majority. AAP leader Kejriwal became the chief minister of Delhi but resigned after 49 days as he was not sure of retaining the support of other parties. By all accounts, during his chief ministership, the police and other official agencies stopped taking bribes fearing swift penal action. But the short tenure of Kejriwal became controversial as he did not give up his habit of agitating on the street against corruption. His tactics delighted the poor sections unhappy with the federal Government: but the middle class was put off by the protesting chief minister causing chaos on the roads and behaving in an “undignified” manner. Then came the parliamentary elections in which AAP decided to make its presence felt all over the country, spreading itself too thin. This brought poor results and most of its supporters turned away in disappointment. Kejriwal was written off as a political leader. But he and his team of dedicated volunteers did not give up and went on to engage AAP in this David-Goliath battle. The Delhi voters forgave him for earlier running away from his office and AAP rose like a Phoenix. AAP this time presented itself in a “new and improved” avatar. Kejriwal did not talk like an agitator or make any startling allegations against big businessmen. His party’s poll campaign focused on the common man’s concerns and good governance. The AAP leaders bore with equanimity the personal attacks coming from the Prime Minister. They avoided any criticism of the Prime Minister and raised no ideological issues. Thus many see AAP’s victory as a victory for a clean and dignified campaign and BJP’s defeat as the defeat of political arrogance and of a domineering Modi. Since symbolism matters in Indian politics, Modi’s sartorial fetish got noticed. Social media went to town discussing Modi’s expensive designer suit with his full name written in golden letters forming the pin stripes. In a sharp contrast, Kejriwal is popularly called a “Muffler Man” as he ties a head scarf around his head and cheeks just as the poor do during the winter. Modi changed his attire thrice in one day during Obama’s visit. Generally, the state election campaigns are left to the state-level leaders who fight these on the local and regional issues. This time, the BJP’s state unit was sidelined. The RSS, head of the BJP family, deployed its dedicated workers on the basis of one campaigner per page of the electoral rolls. The local party workers were left sulking. The party president Amit Shah and Prime Minister Modi invited an outsider and a retired woman police officer-turned-activist, Kiran Bedi, to join the party. They promised her Delhi’s chief ministership and she was paraded as the coming chief minister. The BJP had reasons to believe in its invincibility because after capturing Parliament, it went on to win some state-elections. The sweeping victories were attributed to the Modi wave. The Delhi elections were not a referendum on Modi. Now these are perceived as that because the Prime Minister made himself a centre-piece of the BJP poll campaign, staking his prestige. Through an advertising blitz, the voters were asked to “Go with Modi”. Sure of his magic winning touch, Modi saw it as one more opportunity to assert his leadership. Had the BJP won, all credit would have gone to the Prime Minister. It is because the Prime Minister involved himself in his party’s Delhi election campaign that his policies and performance in the last nine months have come under greater scrutiny. The federal Government will have to take damage control measures by reviewing some of its policies and programmes that have not impressed the poor. The Delhi election was perhaps not just about water, electricity, roads, transport and housing. Many of those who had voted enthusiastically for Modi in the parliamentary poll some nine months ago are feeling somewhat let down. Modi’s diminished credibility has many reasons. He was supposed to end corruption, usher in an era of good governance, control prices and fulfill many other promises. The Modi supporters who came from the secular stream had imagined that once in power, Modi would crush the rabid Hindutva extremists dominating his extended political family. In the wake of Modi’s victory, these triumphant rabble-rousers freely make statements designed to frighten Muslims and Christians. The Prime Minister generally maintains a dignified silence on sectarian hatred fanned by those who detest the concept of a secular India. As if their words are not damaging enough, a campaign is on to convert Muslims and Christians to Hinduism! Some unknown elements vandalized several churches in Delhi while Delhi was being governed indirectly by the Union Government. Modi’s mate Obama found it necessary to give some parting advice about religious tolerance and on his return to Washington said that Mahatma Gandhi would have been shocked by seeing religious intolerance in India. AAP did not make the sectarian and divisive politics of the BJP into a big issue. However, it has succeeded in this area in which the anti-sectarian crusaders failed. The election results have dented the BJP’s self-confidence and curbed its triumphalism to such an extent that the Modi Government would hesitate to implement the agenda set by the Hindutva extremist wing. Those fearful of India being turned into a mirror image of Pakistan may breathe a sigh of relief. Some promises made by AAP will not be easy to fulfil as Delhi is not a full-fledged state. Its financial and administrative powers are limited. The federal Government has a big say in the governance of Delhi and some promises made by Kejriwal require Constitutional amendments. The BJP poll campaign conveyed the message that if a state is ruled by the party running the federal Government, the latter can pump in funds needed to solve the state’s infrastructural problems. The voters did not fall for that. The Delhi election results mark a turning point in the country’s political history. All BJP leaders appearing in the TV studios have promised “self-introspection”. This they would do because of a clear message that the BJP’s traditional core voters alone would never be able to make it victorious. And even the core base cannot be taken for granted. A more significant message is that inflaming sectarian passions does not always pay electoral dividends. However, India’s political history shows that the vanquished of today do not have to lose hope because the voters are as quick to forgive as they are to punish. They never throw out any political formation for ever. The political sinners get an opportunity to redeem themselves. That is why no Indian political establishment can boast of a single Enoch Powell! Indian politicians can get away with murderous statements. This makes AAP’s task of changing the political culture difficult. It should fear the next wave!